Secretary of State for Communities and Local Government, the Right Honourable Sajid Javid MP, visited the West of England on Thursday 13 October 2016, as part of ongoing discussions with the region’s leaders on the devolution deal. The Secretary of State met with Cllr Tim Warren, Leader of Bath & North Somerset Council, Marvin Rees, Mayor of Bristol, Cllr Matthew Riddle, Leader of South Gloucestershire Council and Stephen Robertson, Chair of the West of England Local Enterprise Partnership (LEP). A round table also took place with the Secretary of State and local business representatives from the West of England LEP Board to discuss in detail the opportunities the devolution deal offers and the current issues faced by the region, such as transport and housing challenges. 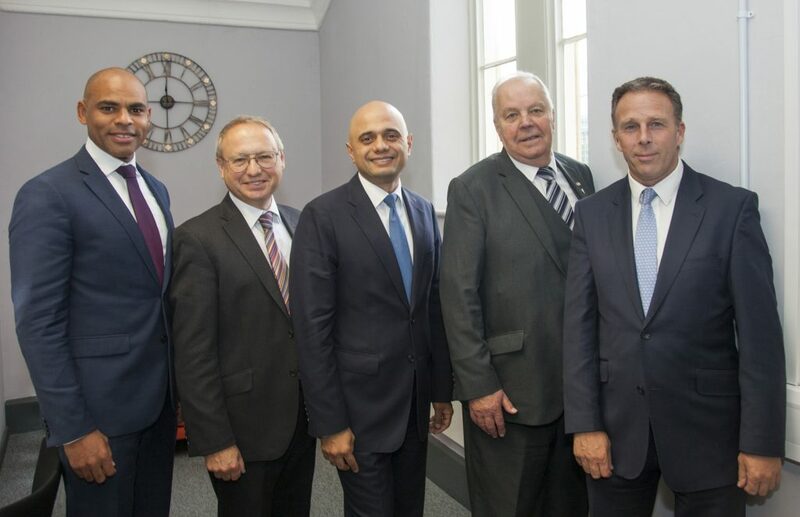 L to R: Mayor of Bristol, Marvin Rees, West of England LEP chair, Stephen Robertson, Secretary of State Rt Hon Sajid Javid MP, South Glos Council, Cllr Colin Hunt, leader of Bath & North East Somerset, Cllr Tim Warren.